Thursday, June 13 and 20; 10 - 3:30. 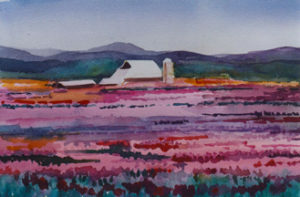 In a new setting, we are offering a basic watercolor class to help those who are just getting started and as a review of the processes for those who find they are limited in how they are working in watercolor. We will practice wet-on-wet which helps you learn how to work with the water and the ratios of water and color which are the secret of watercolor. We will learn the sometimes frustrating but oh so vital technique of seamless negative blending to make the important shapes emerge from the background washes. Next we will learn glazing, working wet. 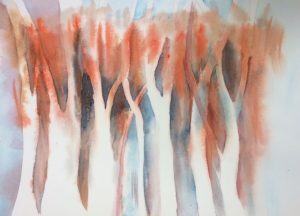 With this you learn the magic of watercolor’s transparency where colors are perceived separately and mixed in the eye. And also learn the different magic of wet blending and charging colors. You will be on your way! Come into Anacortes on Commercial and continue down past the light with the left to the ferry into Old Town. Look for the 600 block, the block before the Post Office. The Good Stuff is on your left, near the corner. Parking may be a challenge so allow yourself some extra time before class to get unloaded and parked. We will take a half hour for lunch. You will probably want to bring your own or order ahead at a nearby restaurant (Gere Deli?). Class is limited to 10 so be sure and sign up soon. Since we are holding class literally in the art supply room of The Good Stuff you can buy another brush, another sheet of watercolor paper at any time. If you are unsure bring what you have. But good basic supplies help immensely in your reaching your potential. To see my complete list go to supply list in the menu. 2-3 full sheet of Arches cold press 140 lb watercolor paper. You may divide them in half + one in quarters. Please contact me at watercolors@rockisland.com for questions.